Do you use a Google Calendar already (the above is just a display of our Shared Google Calendar). Do you wish to combine this calendar with yours on your mobile device / PC etc.? If so, we've tried to give our parents an option which will allow them to combine their calendars so they will never need to miss an event!! The Oxshott Scouting calendar will be updated centrally by our Leaders and Administration / helpers, so you will never need to type in any of the Cub / Scout / Beaver events again! The picture below is an example of a combined diary which may help you decide if you wish to go down this route. ​As you can see (click the image to see a larger version), whilst I have a large number of calendars configured on this iPad, I have pixelated my work calendar, however, I hope it still shows how different calendars may show up clearly within one single view. I also have all of these calendars available on my iPhone device too and synchonisation across all of my devices is automatic (more of a function of the Google Calendar than anything I've done I assure you!!). I've used a different view on the iPhone example picture (again, click for a larger version). You will see that instead of the all day event on the iPad picture to the left, this is a specific event which the Scouts/Cubs/Beavers have in their calendar. ​I like the idea of a combined calendar. Is it complicated or difficult to set up? Whilst my examples above may appear complex (and you can put lots and lots of calendars together if you wish!) don't let me put you off, as it doesn't have to be!! I will attempt to explain in a step by step approach, the way in which you can get to a similar (hopefully less complex than mine!) 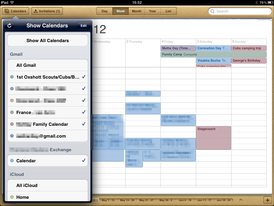 calendar view. A small investment of time in reading through this guide may just help you in becoming slightly more organised - and never miss an event again!! ​But ... I don't have an Apple iPhone / iPad. Can I still access a combined calendar? Yes you can - not a problem at all. If you do have a Smart phone, Google Calendars are adapted to synchronise across multiple operating systems and devices. If you do not have a Smart phone, then you can still use the standard Internet / Web version of Google Calendar to combine calendars. I am not planning on creating a step by step guide for each alternative, however, visiting the Google homepage will give you access to their help files which should be able to lead you in the correct direction. The final example picture on the right here, is a two day view of the same weekend as the iPhone example (St George's Day 2012). There are so many ways you can choose to show your appointments that I can not show them all. I will however, give guidance on how to set it up in the same way that I have (as that's the one I like!). If you wish to choose another way - feel free!! ​Yes - I'd like to combine the Scouts Calendar with my own! Excellent!! You will no longer need to worry about missing or forgetting a Scouting event! Continue on to the next page in the Calendar Help section which will talk you through the set up. The Second page of the Calendar Help is available at this link here.